Healthy eating is our primary goal in our family. I always try to make things from scratch and eat as naturally possible. I don’t think we want to have unnecessary chemicals in our bodies and having homemade jam is quite easy. 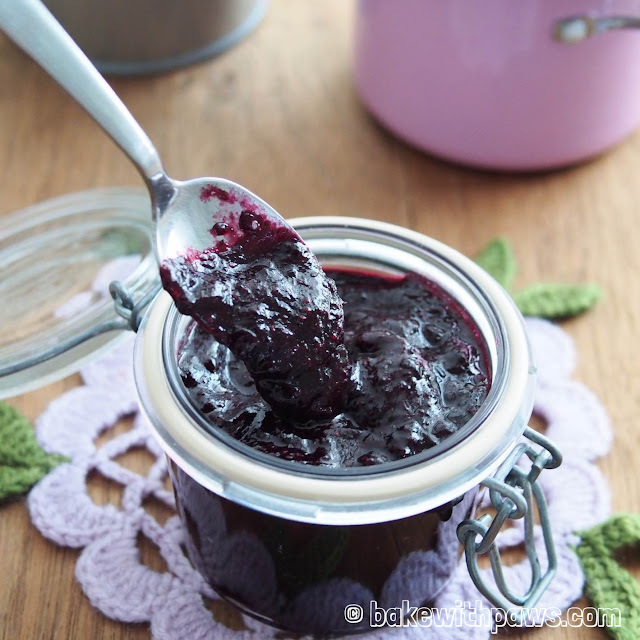 Try this homemade blueberry jam recipe, it is very simple to make with low sugar and without any pectin added. Pectin is a gelling agent found in commercial jams. Most of the fruits contain natural pectin so it’s not necessary. Fresh Blueberry can be very expensive in Malaysia. I like to use frozen imported fruits eg. Strawberry, Raspberry and Blueberry. I find frozen fruits has higher nutritional value and cheaper compared to fresh berries. Normally, fruits to be frozen are picked at peak ripeness off their vines and immediately frozen and packaged within a few hours. Place all ingredients in a saucepan. Bring the mixture to a boil over medium heat. Turn the heat to low and simmer for 15 o 25 minutes or until the mixture thicken. Stirring regularly. Smash the blueberries with back of a spoon while cooking. Let the jam cool completely before transferring to a clean jar. Store in the fridge and eat within a week. If use fresh fruits, the cooking procedure is the same? Thank you for dropping by. Yes, the same method. Hi, thank you for asking. I got mine from B.I.G. You should be able to get it from Village Grocer and Jaya Grocer too.